On the pair side of things, Austin Northern and Joe Lakey, who were former club golfers at Liberty University fired a first round 66, and Luke Stull and Alex Wrockledge were just two behind shooting a best ball score of 68. Teams prepared themselves for the Moorland course on Sunday as it was shaping up to be another great finish. 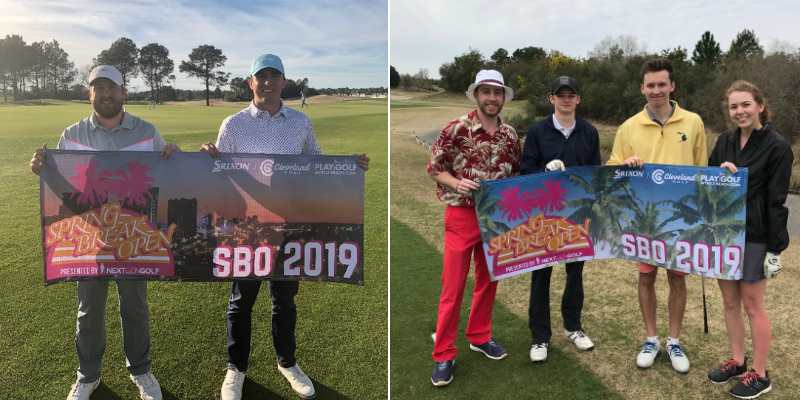 The final round of the 2019 Spring Break Open took place on the Moorland course. This great test of golf is known as the members favorite course on the property and heard the same from many of the players. Scores were a bit higher for the second round, but it made for a great finish between teams and pairs! After all the scores were turned in, Team Myrtle Beach Agents took the trophy home as the top team with a score of 281. This team consisted of Austin Northern/Joe Lakey and Matt Homza/Matt Hearl and barely edged the second place team Of Moosh and Men. With an impressive two rounds in the 60’s, Austin Northern and Joe Lakey took home the top pair with rounds of 66 and 68 (-9). Thanks to everyone who competed the last two weekends, and to everyone who has followed along with us. It was a great two weeks in Myrtle Beach, and we're excited to see what's in store for next year's Spring Break Open!